Thus far in the 40-plus Big Finish audios I’ve listened to regarding our favorite Time Lord, we’ve had small, intimate serials set in one location, we’ve had sweeping historicals covering the majesty of times past, we’ve had planetary invasions by hostile aliens, and we’ve had time travel in pursuit of one man. We’ve had brilliant acting, horrible accents, audios that have been better than some televised episodes of Doctor Who, audios that have been worse than some televised episodes of Eldorado, we’ve had panto, we’ve had musicals, we’ve had Nimons, we’ve had Cybermen, and, of course, we’ve had Daleks. So now, take all of that and turn it completely on its ear. Creatures of Beauty is a unique type of serial that demands the listener’s full attention and rewards them in the process, asking questions about the very nature of the Doctor and the show while delivering its tale in a very unique way; the entire story is told out of sequence! 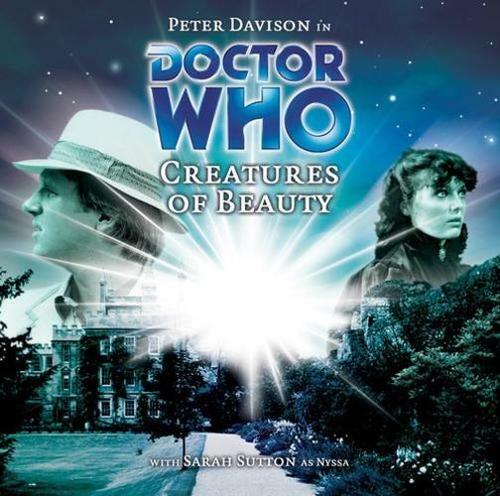 Instead of relying solely on its gimmick, Creatures of Beauty contains several strong performances, a touch of horror, and a bleak look at what the Doctor’s travels truly entail. Explosions. A harsh whisper of the word “beautiful.” A women explaining to the Doctor about the difficulty in finding a cure for her planet. The screams of Nyssa and a young woman as they struggle over a knife…and then the Doctor wakes up, in the back of a delivery van, as Nyssa explains they still have four days to go until they reach their destination. And this is all in the first seven minutes. The main concern with utilizing such an unorthodox style of presentation, of course, is the possible confusion on the part of the listener. It’s very easy to think that the tracks were mixed up or loaded in an incorrect order the first time through. I actually had to find an online synopsis in order to make sure I hadn’t missed anything or somehow hit “shuffle all.” In my defense, it was 4:45 am on a dark commuter bus, and by the afternoon ride home, I had no trouble following the second episode (as an aside, when I DID hit “shuffle all” during the first episode of the next serial, Project: Lazarus, I thought that play was telling things out of order for a few moments before I realized my mistake!). Briggs keeps the plot easy to follow, but this isn’t a play that really can be listened to in a casual manner. How many times has Peter Davison’s Doctor looked at the carnage surrounding him and proclaimed “there should have been a better way?” The light-hearted Doctor from The Church and the Crown has been replaced by a more weary, cautious Doctor, understandable in a way considering the events of Earthshock and Spare Parts. This time out, the Doctor is very concerned with meddling in local affairs, even though his curiosity gets the better of him eventually. The weight of the world in on his shoulders, until it’s time to be heroic and rescue Nyssa from the clutches of the security forces. It’s a bit off-putting to hear a more hesitant Doctor, but the reasons for the Doctor to step lightly are laid out as the serial progresses. One of the reasons I enjoy the Five/Nyssa serials so much is that I believe many of the scars and bottled up emotions that led the Eighth Doctor to regenerate into the War Doctor can be traced back to everything that the Fifth Doctor endured during his lifetime; the death of Adric, the departure of Tegan, and many of his best intentions backfiring on him. Is it any wonder that he’s once bitten, twice shy in this story? And one of the reasons I enjoy the Five/Peri audios is because, in those, it seems like the Doctor is finding his love for the wonders of the universe all over again. Nyssa is the type of Big Finish companion who isn’t there solely to ask questions so the Doctor can provide exposition, and she’s not there solely to get in trouble so the Doctor has a reason to bail her out. She challenges the Doctor and forces him to get involved, best seen in Spare Parts. In Creatures of Beauty, Nyssa is put through the wringer by Briggs’ script. On a planet filled with a mutated population, Nyssa is the titular “creature of beauty,” unmarked and unflawed. That doesn’t save her, though, from watching someone stab themselves in an effort to cut a piece of them away, and it doesn’t save her from a harsh interrogation by the Veln security forces. Sarah Sutton plays frightened with the best of them, and her nervousness at their situation is a stark contrast from the cool and collected Nyssa we’ve seen in other serials even as her sympathies for the Veln’s situation come forth. It adds another layer to her reasoning to leave the Doctor and help the suffering patients during her television farewell in Terminus. David Daker’s Gilbrook is a classic Who villain, and seeing his ”story” out of order shows us a hard-nosed, paranoid security officer at “first” and a weary bureaucrat who just wants to protect Veln from enemies foreign and domestic at the “end.” He’s effective at his job, and sticks with the listener after the serial’s conclusion. His hatred is poured against the “beautiful” who don’t know the suffering of the rest of the diseased Veln, including Lady Forlean, played by Jemma Churchill, who is desperately looking for a cure by any means necessary. Joining her in that quest are the Kolteen, blamed by the Veln for the current state of affairs, and voiced by, no surprise, Nicholas Briggs. David Mallison, as Brodlik, is torn between the situation of his people and helping the innocent Nyssa while trying to find out the truth about her. Nigel Hastings is Quain, the shady smuggler who either assists the Lady Forlean out of necessity or because there’s profit in the cure. The desperation is evident in everyone’s performance, who know that their days are coming to an end (“our civilization isn’t dying, Doctor. It’s dead.”) and are trying to give the Veln a fighting chance. The music is very low-key in this serial. The focus is more on the sound effects. A heartbeat monitor, the crunch of a snowplow, the squish of a knife cutting flesh and subsequent screams, the shrill voice of the Kolteen, a nauseous sound bio-scan, the beating Gilbrook lays into Brodlik; this turns out to be a very brutal serial, but not in an over-the-top sense, but in a way that makes the listener take notice that, despite the name, this is a very ugly story that probably won’t have a happy ending. Without going into too much detail, I felt like Nicholas Briggs was channeling a bit of David Cronenberg with his script. Not only was there a sinister undertone to the story, but there are also elements of body horror that will cause the listener to squirm in their seat. At what cost to one’s own essence will someone go to save themselves? Or worse, what will they do to save someone else? Who’s right in this case, the Veln who hate the Kolteen for what they’ve done, or the Veln who want to help the Kolteen to help the Veln? Are the lengths Lady Forlean will go to justified? Is the Doctor right not to meddle? If he did meddle, would things be better or worse? Questions are asked…and never answered. I’m specifically reminded of Cronenberg’s Eastern Promises, a very brutal movie with an ambiguous ending. The problems and delimmas of the main characters are laid out, and the plot is advanced through the movie, but in the end, everything is NOT wrapped up into a neat little bow. Some things are better and some things are worse. Creatures of Beauty is very much the same way. If played in the “correct” order, this would actually a very boring story because of the open-ended conclusion. But by putting the pieces in a different order, the questions are asked, but the solutions are never clearly laid out. And in the end, there’s one question that’s asked, by virtue of the very last scene of the serial. When the Doctor meddles, are things better…or worse? And it’s not asked solely with regards for the fate of the Veln. This entry was posted in Big Finish Review and tagged 5/5, Big Finish, Doctor Who, Fifth Doctor, Nyssa, Peter Davison. Bookmark the permalink.